The rivalry between Rampage Jackson and Rashad Evans has been festering for such a long, long time. 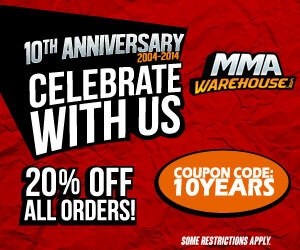 It all began when Rampage defeated Keith Jardine, Rashad’s teammate and training partner. 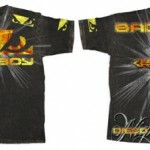 This grudge continued when they were appointed as opposing coaches on The Ultimate Fighter Season 10 Heavyweights. There the two displayed their extreme animosity toward each other, often coming close to fighting on the set. 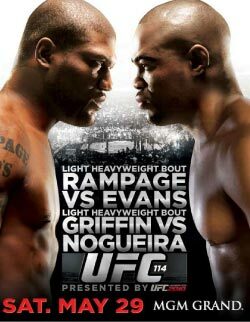 Finally, we get to see this grudge match between two of the former Light heavyweights unfold in the main event of UFC 114 Rampage vs Rashad. Also on the card is Michael Bisping, the British middleweight fighter who is looking to attain a spot as a top contender in the division. Lightweight Diego Sanchez will also be fighting as he rebounds from his devastating loss from BJ Penn, that left Diego with an incredibly huge gash on his forehead.